The Ice House :: Hollywood Comes to Pasadena - Special 10 Comics for $10 Show!!! with Frank Nicotero and more! Hollywood Comes to Pasadena - Special 10 Comics for $10 Show!!! with Frank Nicotero and more! 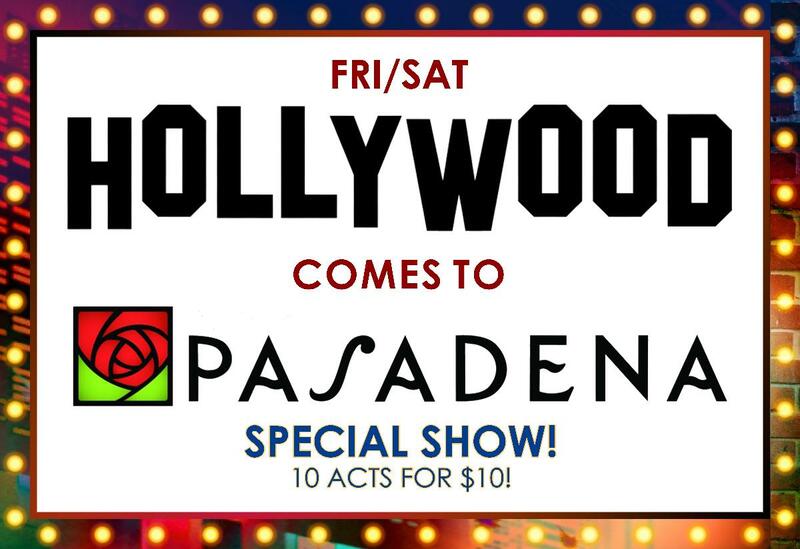 Hollywood Comes to Pasadena is usually 6 act comedy show, featuring top tier comedians and entertainers, along with Mystery Guests, who will drop in to do a set and surprise the audience. TONIGHT, IT'S 10 TOP TIER ACTS FOR $10!!! - of course, there's still all the good stuff below too! Before the show, Ice House guests can hang out on our newly redecorated patio to enjoy “close-up” magic and sleight of hand wizardry performed by magicians and illusionists from Hollywood’s famed Magic Castle. We also have a new back-drop for guests taking photos, with velvet ropes and a prop mic...perfect for immortalising your night at The Ice House After each show, guests who purchased admission will get to spin our “Gift Wheel” to win a FREE prize, like ICE HOUSE swag, stuffed polar bears or a free stay at the glamorous HOTEL CONSTANCE! Frank Nicotero: Frank Nicotero has been doing stand up for over 20 years and is a regular at THE WORLD FAMOUS LAUGH FACTORY, THE ICEHOUSE and THE COMEDY AND MAGIC CLUB. You can purchase Frank's first comedy CD "That Street Smarts Guy" online now! Most people remember Frank as the host of the wildly popular comedy game show STREET SMARTS which ran in syndication for 5 years. Currently you can watch him daily on Yahoo Studio's PRIMETIME IN NO TIME which is a 3 minute recap of TV's water-cooler moments from the night before. In March of 2012, Frank will shoot the 1,000 episode which has had over 650 million views making it the most popular show in the history of the internet! Frank also hosts the kids game show GAME OF LIFE, based on the popular board game, on The HUB Network every weekend. You can also hear Frank as the voice of TruTV's AMERICA: CAUGHT ON CAMERA. A professional wrestler from turned stand -up comedian, Jay Washington’s antics during wrestling prmo’s made it natural for him to make the transition from the squared circle to the stage. Coupled with high energy and quick wit Jay has performed from comedy clubs to colleges. Jay is currentlyheard on Sirius XM, he is an internet favorite as a host on the popular Collider, Afterbuzz and Screen Junkies network. He also has been seen on NETFLIX, BET, VH1, POP TV and can be seen in the Spike Lee Joint “Chi-Raq” alongside Wesley Snipes as well as feature films “Landline” with Tom Arnold and “Imperfections” with Virginia Kull and Zach McGowan. He has also been seen on Netflix on The Joel McHale Show and the "Strong Black Lead" series.